Tetraethyl lead (TEL) is a liquid with the chemical formula (CH3CH2)4Pb. Once widely used (circa 1925 to 1990) to increase the octane rating of gasoline (petrol), TEL usage in gasoline has been largely phased out by most nations primarily because of the toxicity of the lead emissions from spark-ignited internal combustion engines burning gasoline containing TEL. Another reason for discontinuing TEL usage was that it degraded the efficiency of the catalytic converters installed in automotive vehicles to reduce their emissions of air pollutants. TEL is still available for use as an additive to increase the octane rating of aviation fuel for aircraft powered by internal combustion engines. Pure tetraethyl lead, as distinguished from tetraethyl lead fluid (TEL fluid), is a viscous, colorless liquid that is highly lipophilic and soluble in fats, oils and lipids as well as gasoline and other non-polar hydrocarbons. The various other physical and chemical properties of tetraethyl lead are listed in the adjacent table. At the temperatures found in spark-ignited internal combustion engines, TEL decomposes completely into lead and lead oxide (PbO) and combustible, short-lived ethyl radicals. Lead itself is the reactive agent that enhances the octane rating of gasolines and tetraethyl lead serves as a gasoline-soluble lead carrier. The addition of as little as 0.8 ml of TEL fluid per liter of gasoline (3 ml/gallon) of gasoline was equivalent to adding 0.5 g of lead per liter of gasoline and resulted in significant increases in the octane rating of the gasoline. For more information, see: Lead, Gasoline, and Octane rating. 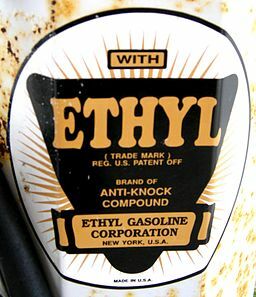 Sign on an ancient gasoline pump advertising tetraethyllead by the Ethyl Corporation. In the 1920's, petroleum refining technology was rather primitive and produced gasolines with an octane rating of about 40 – 60. But automotive engines were rapidly being improved and required better gasolines, which led to a search for octane rating enhancers. That search culminated in 1921n the development and use of tetraethyl lead as an octane enhancer. Its utility was discovered by Kettering and Thomas Midgely Jr. By 1923, "When Thomas Midgley accepted the Nichols Medal in March, 1923, he had almost returned to normal after fighting a winter-long battle with lead poisoning." Cite error: Invalid <ref> tag; invalid names, e.g. too many Despite ethanol being widely recognized as an alternative octane rating enhancer,  the less expensive TEL quickly became commercially available as what was called TEL fluid, which contained 61.5 weight % TEL. The addition of as little as 0.8 ml of that TEL fluid per litre (equivalent to 0.5 gram of lead per litre) of gasoline resulted in significant octane rating increases. In 1924, New York City Medical Examiner Charles Norris, and his forensic chemist, Alexander Gettler, were asked to investigate possible occupational exposure and toxicity in a plant in New Jersey, recently opened by Standard Oil. Workers called the TEL facility the "looney gas building" because hallucinations were common. Within a year, 32 of 49 TEL workers were hospitalized and 5 were dead. The building manager said "these men probably went insane becayse they were working too hard." Thomas Midgely Jr., the General Motors engineer that worked out the needed TEL concentration, put his hand in a bowl of TEL, saying "I'm taking no chances whatsoever. Nor would I take any chances doing that every day." Midgely, a few months after the press conference, traveled to Europe for treatment of lead poisoning. For about the next 50 years, TEL was used as the most cost effective way to raise the octane rating of gasolines. During that period, petroleum refining technology grew until high-octane gasolines could, in fact, be produced without using TEL. Also, in about the 1940's, it was discovered that the lead being emitted in the exhaust gases from vehicular internal combustion engines was a toxic air pollutant that seriously affected human health. Because of its toxicity and the fact that catalytic converters being installed in vehicles could not tolerate the presence of lead, the U.S. EPA launched an initiative in 1972 to phase out the use of TEL in the United States and it was completely banned for use in on-road vehicles as of January 1996. Using TEL in race cars, airplanes, marine engines and farm equipment is still permitted. TEL usage has also been phased out by most nations worldwide. As of 2008, the only nations still allowing extensive use of TEL are the Democratic People's Republic of Korea, Burma, and Yemen. ↑ Béla G. Lipták (2003). Instrument Engineers' Handbook, 4th Edition. CRC Press. 0-8493-1083-0. ↑ Phasing Lead Out of Gasoline A report issued by the United Nations Environmental Programme (UNEP). See page 8 of 23 pdf pages. This page was last modified 17:58, 22 February 2012.